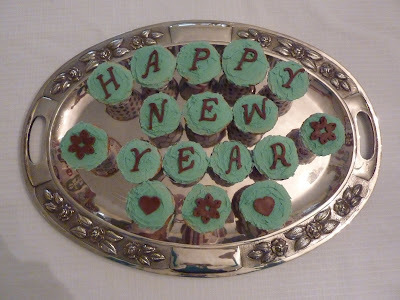 crafting with katie: Happy New Year! Happy New Year! Here are some cupcakes I made to celebrate New Year's Eve last night. I used the Trader Joe's Yellow Cake Mix, which is delicious, homemade buttercream frosting, and Duff's Chocolate Fondant for the toppings, cut with the Cricut Cake Mini. The letters and shapes are from the Martha Stewart Seasonal Cake cartridge. I also made cupcake wrappers from the Easter cartridge, but you can't really see them here. Those are cute, and they look delicious. However, I am supposed to NOT be eating those types of things, so you are a little evil ;) *LOL* Well, not evil... but certainly tempting me with your lovely treats. Have a great 2011!